DD Form 2086-1 - also known as the "Record Of Freedom Of Information (foi) Processing Cost For Technical Data" - is a United States Military form issued by the Department of Defense. The form - often incorrectly referred to as the DA form 2086-1 - was last revised on July 1, 1997. Download an up-to-date fillable PDF version of the DD 2086-1 below or request a copy through the chain of command. Please read instructions on back before completing form. * Chargeable to all requesters. 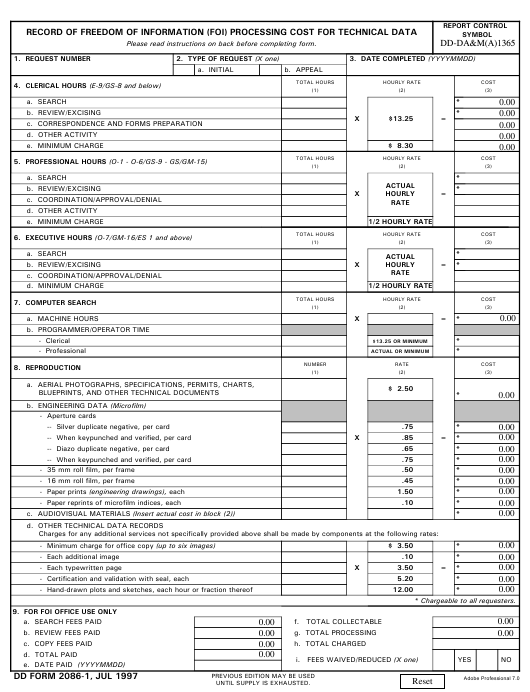 This form is used to record costs associated with the processing of a Freedom of Information request for technical data. Search/Review/Excising - See explanation above. Coordination/Approval/Denial - See explanation above. initial request or appeal of a denial. costs are chargeable to the requester. cost which is fully chargeable to the requester. requesters as computer search time. wage of the person doing the work. Search Fees Paid - Enter total search fees paid by the requester. Review Fees Paid - Enter total review fees paid by the requester. other locations, restoring files, etc. in the total paid block. in Chapter VI, Section 3, DoD Regulation 5400.7-R.
cost in most cases will exceed the total collectable cost. approval for the release or denial of the requested information. or an "X" in the "NO" block.